OVER 62 DESIGNS This CD artwork collection is a great addition to our artwork family. This package was designed for those interested in creating wedding, anniversary, or romantic images on the surface of their choosing. This high quality artwork will enhance your engraving or sandblasting artwork library. The CD contains 62 JPG images. We also have them in .eps vectorized images. The EPS images can be reduced or enlarged with no loss of quality. (Be sure to have a program to open the EPS format … Corel Draw, Adobe Illustrator, etc.) You will find both traditional and modern designs of the highest quality. 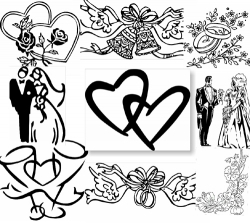 Designs included in this package are wedding bells, hearts, bride and groom, doves, champagne glasses, roses, wedding rings, ribbons and bows, and much, much more. This package is a must have for use with your SCM sandblaster or engraving tool. Remember … success begins with quality artwork!!!! !